Lower back pain occurs to almost everyone at some point in their lives. According to statistics, a massive 80% of people will face some episode of lower back pain, with many of those have recurring or chronic episodes of pain. This impacts all aspects of your life, from working to moving to even sleep. While your sleeping style can change which mattress is ideal for you, there is a range that nearly every type of sleeper can agree on. Here we’ll go through what you should look for in a mattress for lower back pain and our top pick for the best mattress for lower back pain sufferers. Be sure to speak with your doctor about your condition and decision to get a new mattress. Some conditions may require different types of mattress. This is based on what the majority of lower back pain sufferers need. Plush? Firm? Which is Best? The feel of the bed is perhaps the most important thing to consider when buying a mattress. Your back needs to relax, but not so much that sags and causes pains from going too inward or outward. Not only that, but your sleeping style can also impact which feel is best. There are three types of sleeping styles: side, back and stomach. Back sleepers need a bed that is soft enough to cradle their weight, but firm enough to hold their back in place. Side sleepers need a bed that can curve their spine properly while holding their shoulders and hips. Stomach sleepers need a bed that keeps them afloat and keeps their back properly positioned. In general, a medium firm mattress tends to be the best mattress for lower back pain sufferers. This is ideal for back sleepers, tends to offer enough support for side sleepers and should keep your back properly positioned if you sleep on your stomach. Not only that, but firmer mattresses tend to take pressure off your muscles and transitions it to your bones, allowing your muscles to relax as you sleep. Many people who use firm or medium firm mattresses find that their back pain reduces or goes away completely. Be sure to speak with your doctor to give his or her opinion, but many find that this transition helps their pain. There are many types of mattress. There are latex, spring, hybrid, memory foam and so on. So, which is the best mattress for lower back pain sufferers? While you might have your own preference, in general most people find that memory foam helps the most with back pain. There are a myriad of reasons why. Unlike most other materials, memory foam is truly ergonomic. It literally curves around your body, creating a little pocket that is specific to your body shape. Each night it will allow your body to mold it, thus ensuring that you are molding the bed itself of it molding you. This ergonomic nature allows the bed to cradle your spine the way it should be handled. Aside from cradling your spin, memory foam tends to have a firmer feel, making it much easier to find a properly firm mattress that will help reduce your lower back pain. Not only that, but unlike other materials, memory foam will rarely sag with age, ensuring that you get more use out of it. You could go the extra mile and search out a mattress specifically made for lower back pain, but that doesn’t mean that it will be comfortable. Remember, you’re trying to sleep, despite your pain. Sleep should take priority, so you need to consider some features that will keep you comfortable throughout the night. This will reduce excess movement (which could lead to further back pain) while allowing you to wake up, rested and happy. We have already covered the proper firmness and material, so what other features should you consider? A massive number of sleepers find that they overheat during the night, which leads to tossing and turning. You can fix this by choosing a mattress with a cooling gel foam and breathable foam layer. These are made specifically to stay cool and allow air to flow through the mattress, which whisks the heat away before it can build and bother you during the night. It will also have a soft cover that feels good against your skin. Remember, the best mattress for lower back pain sufferers will be comfortable. Lastly, the bed should be designed to relieve your pressure points so that it feels like you’re sleeping on a cloud. This will allow your whole body to truly relax so that you can get the best, pain-free sleep of your life. 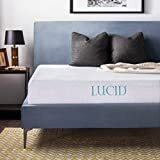 With all that in mind, our top pick for the best mattress for lower back pain sufferers would be the LUCID Gel Memory Foam Mattress . This mattress combines literally all of the elements discussed thus far, ensuring that it’s perfect for your lower back pain and overall sleeping needs. Plus, if your back pain does disappear, you still have a comfortable bed to sleep on. So, let’s go over the basics. This 10-inch bed uses medium-firm memory foam with a gel layer that keeps you cool during the night while properly supporting your overall weight and spine so that you feel little to no pain while sleeping. It will remove pressure throughout your body and allow you to really relax as you drift to sleep. The memory foam has been properly ventilated so that you get fresh air while sleep, which keeps you cool and removes smells. The top cover is soft and feels wonderful on your skin, ensuring that you get some comfort as you lay on it. The two layers (gel foam and dense foam) are made to keep your body still as you sleep, plush it won’t transfer any motion. On top of all that, the foam is CertiPUR certified, meaning that it’s safe, independently tested and that it uses only the minimal amount of petro chemicals in its formation. All of this together should tell you that this mattress isn’t just great, it’s the best mattress for lower back pain sufferers.